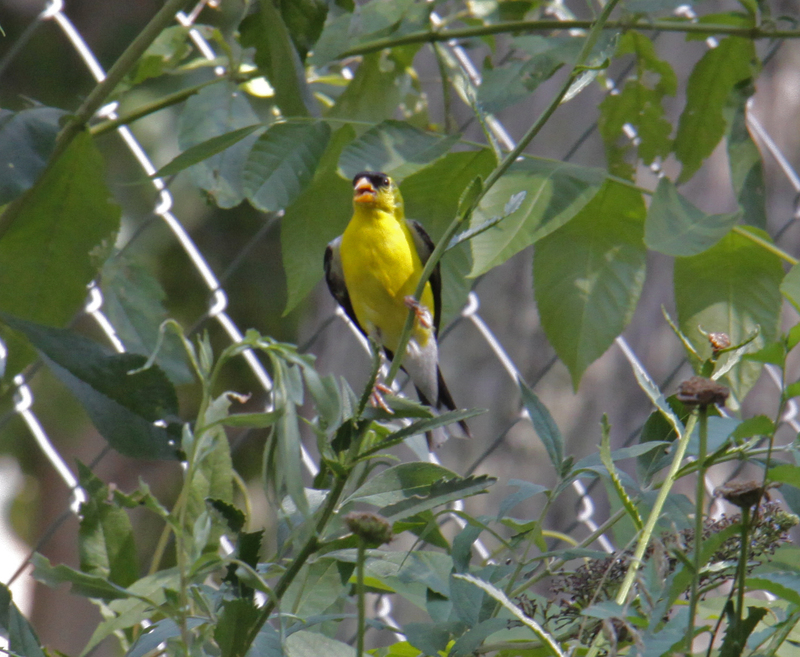 Each July when the Goldfinch broods fledge, my garden is visited by family groups of Goldfinches. The bright yellow males are the first to be noticed. He perches on the tall stems of the Shasta Daisies, surveys the undergrowth for stalking urban leopards, house cats. The all-clear call is given and the rest of the group moves in to feed. In the background of the photo above can be seen the compound leaf of an Indiana Black Walnut, a tree that was once common through out Indiana before the forests were clear cut and burned for agriculture. The squirrels plant these trees, at one time I believed what I was told, squirrels bury tree seeds to hide for their next meal. After watching squirrels burying maple seeds one after another in my garden and the fact that the nearest walnut tree is a city block away from my yard, I tend to think that squirrels are distributing the tree seeds to replenish the forest habitat. After all no trees no squirrels. July in my perennial wild flower garden. The wild flowers were planted about twenty years ago, from bag and canned wild flower seed mixes. I just turned the soil, broadcast the seed mix and let nature take its course. Every now and then, I'll root out the grass that invades from what little lawn that I have. No ferts or pesticides, dividing the root clumps is a no-no also. Basically, no maintenance is the rule, I just let it grow. When I see plants taking hold that I do not want I just pull them out by the roots. 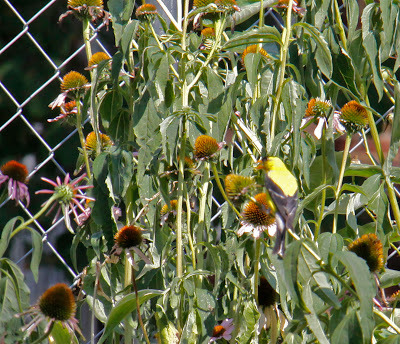 The deadheads are left on the stalks to re-seed, provide food for the visiting birds and shelter for the overwintering insects. I was first introduced to the Blister Beetle in the mid 70's. In a way that I would not wish upon my worst enemy or best friend( in creationist science your best friend is your worst enemy, talk about weird science, lol). Back to the point. I was strolling down the street, was a beautiful summer's eve, when I felt something crawling on the back of my neck. I reached back, gave it a whack and picked it off my neck. First glance I was relieved that it was not a hornet, yellow jacket or bee. I thought only a beetle, good. As I continued my stroll and examination of this unknown beetle, I observed a reddish fluid on the beetle and my fingers. Suddenly, my neck and fingers began to burn, as if a hot comb was pressing against my skin. The back of my neck and fingers blistered something awful but the pain became scientific bliss when I realized that I had my first Blister Beetle. 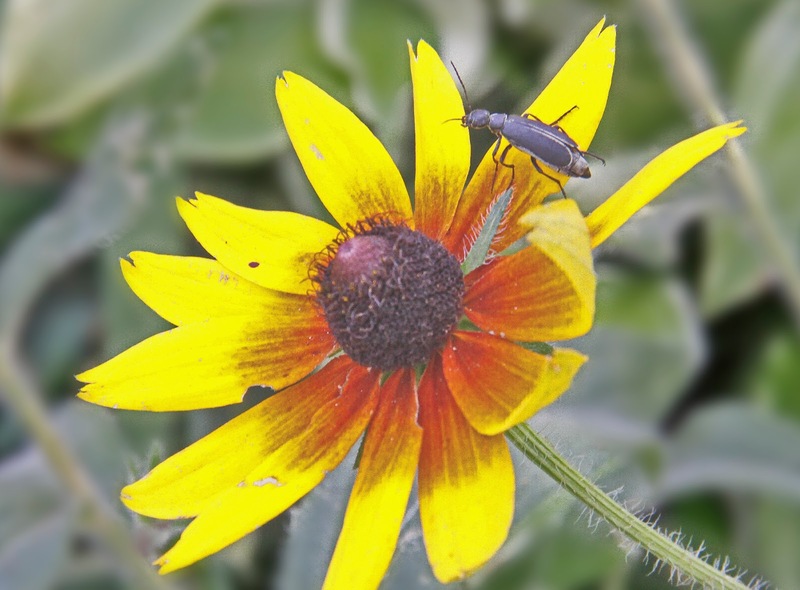 The beetle in the photo is the Margined Blister Beetle (Epicauta pestifera). Common in the eastern USA. These beetles are vegetarians as adults. The eggs are laid in the soil, upon hatching the instar (nymphs) seek out grasshopper eggs for food. During a drought, when grasshopper eggs are few, they substitute ground nesting bee larva for their food. 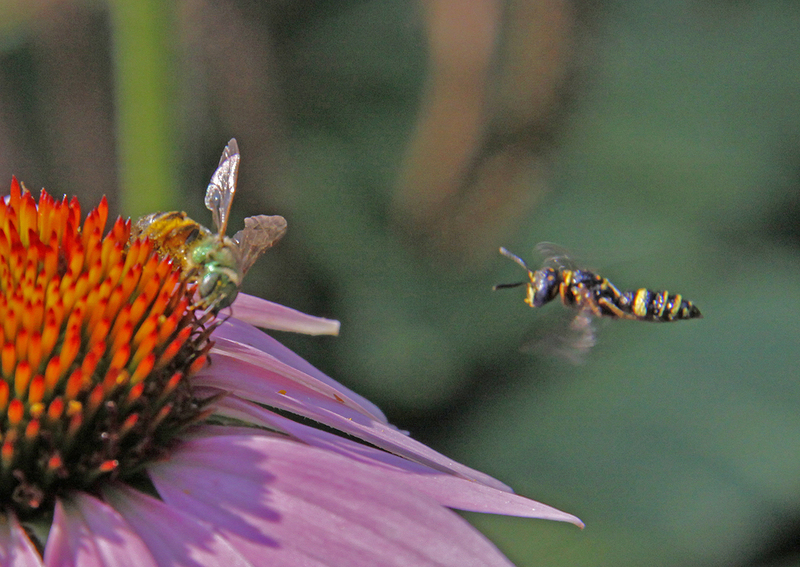 Some consider them parasitic but they are actually insect predators(insectivores). The blister agent is secreted by the males and given to the females during mating. She puts the fluid on the eggs. This makes the eggs poisonous and repels any creature that finds the eggs. The toxic chemical in the fluid not only burns but it also kills horses, grazing animals and humans when the beetles are eaten. Old timers out there, remember the aphrodisiac "Spanish Fly", well, the ground up beetle was it. Now banned around the world because it is a deadly poison. If you ever wondered what a Spanish Fly looked like, here it is.